More news arrives from the indomitable due of Peter Thompson and Michael White at Ocean Independence as they jointly list the 31.4m motor yacht Magnifico for sale. 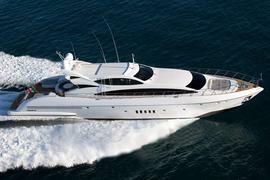 She's a Mangusta 105 Sport motor yacht built by Overmarine in 2007 with eight guests accommodated in a full beam master suite, VIP stateroom and a double and twin cabin. Twin 2400hp MTU engines powering KaMeWa waterjets give Magnifico an impressive top speed of 33 knots and, currently lying in Doha, Qatar, her asking price is €6.5 million.